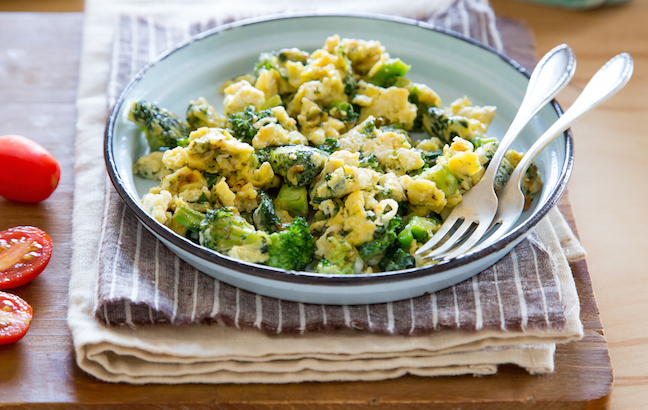 This cheesy broccoli kale egg scramble recipe is loaded with fresh greens and lots of cheese. It’s my favorite way to incorporate more dark, leafy greens into my family’s breakfast! This is by far my favorite way to incorporate more dark, leafy greens into my family's breakfast. Step 1: In a medium-sized bowl, whisk together the eggs, grated cheese, milk, salt, and pepper. Set aside. Step 2: Heat the olive oil (or butter) in a large non-stick frying pan. Add the sliced scallions and sauté for about 2 minutes, or until slightly wilted. Add the chopped broccoli florets and kale, and mix well. Sauté for about 5 minutes or until the broccoli is bright green and tender, and the kale leaves have wilted. Step 3: Increase the flame to high and pour in the egg and cheese mixture. As the eggs begin to set, use a wooden spoon to stir and scramble. Cook for about 2–3 minutes, or to your desired doneness. 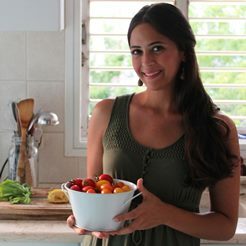 Serve immediately with buttered whole grain toast and fresh cherry tomatoes.